Just a quick post for you to share my Thanksgiving Day mani. I plucked the feathers off the turkey myself! Just kidding. Actually the feathers were part of my Nail Art Society November subscription. I did a gradient on my other nails using Megan Miller Champagne and Frambois, These are the perfect colors to represent Cherry Pie. Then I placed the feather on as an accent nail. I am not sure the colors complement each other as much as I would like but they definitely represent Thanksgiving! Have a Happy Thanksgiving everyone. I am off to visit family and stuff myself with traditional Thanksgiving food. I recently won the Megan Miller fall collection from Bloom.com. I had never tried this line of polishes so when it came today I couldn't wait to try it out. The colors are phenomenally crisp and the formula is amazing. These polishes only needed a couple of coats and dried quickly to a high gloss finish. The timing couldn't have been better for me. Just yesterday I had an idea for some fall nail art but I couldn't decide what colors to use. These colors worked perfectly for my "falling leaves" nail art. I used the Megan Miller Champagne for the base color. Champagne is a gorgeous soft yellow/gold shade with lots of shimmer and shine. Then using a nail art brush I applied Megan Miller Ganache for the tree branches and Framboise for the leaves. Don't worry about making the leaves and branches perfect. Even in nature each leaf and branch has imperfections. Framboise - a wonderful cranberry red with a jelly like consistency and a high gloss shine. Ganache - a wonderful deep brown cream polish with a stunningly high gloss finish. 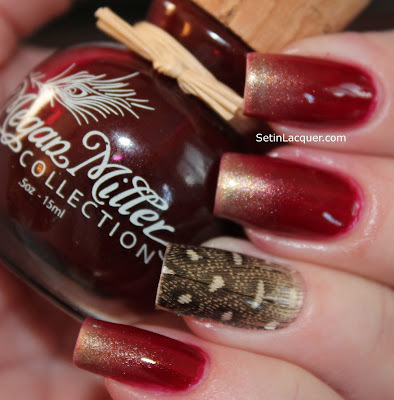 One note I should make - do not use Seche Vite as a top coat with the Megan Miller polishes. I tried to seal my nail art off and the two do not combine well at all. Megan Miller polishes can be purchased at Bloom.com for $12 each. These polishes were sent to me as the prize for a contest. All opinions are my own.